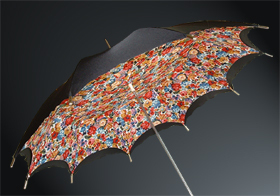 Mora-Igra's ladies umbrellas are for the client who desires a unique hand-made fashion accessory rather than just an umbrella. With a huge range of materials, frames and handles for the client to choose from, a truely unique piece of fashion can result. 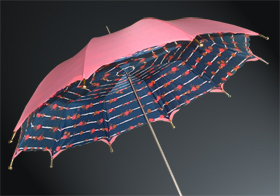 Alicia has a huge range of umbrellas in stock, from sturdy all weather everyday umbrellas, to gorgeous fashion creations to frilly lace umbrellas for special little girls. 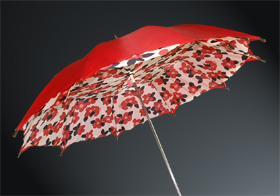 Choose from a large range of umbrellas in stock or design something that is truely your own.